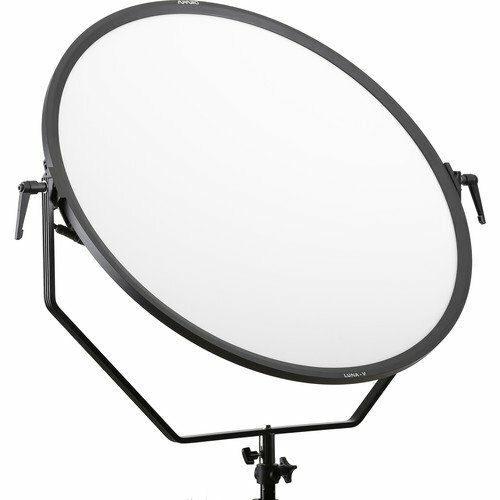 Featuring variable color temperature, AC or battery power options, and a thin profile, the 31″ Luna-V LED Soft Light from Aparo has what it takes for superior light quality in the studio or on the road. 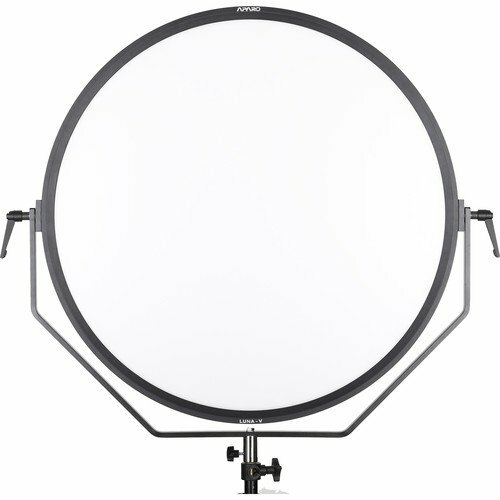 A good choice for portraiture, glamour, or hair and makeup, the first thing you notice is the Luna’s distinctive round shape that yields circular, natural-looking catchlights in the eyes of your subject. To achieve maximum softness the fixture’s LEDs have, unlike the standard “direct” orientation, an “edge-lit” design whereby the diodes are located around the periphery of the luminaire and pointed toward the center where their output converges without hot spots. Mounted to a yoke with a 5/8″ receiver, the light’s thin profile and low heat allows you to squeeze it into tight spaces or work close to the talent without causing discomfort. It’s also a solution for low ceilings, in fact, with the right hardware you could mount the Luna overhead to the ceiling. The Luna-V has color temperature control from 3000 to 5600K, saving you the bother of applying gels and allowing you to meet any ambient light challenge. Light intensity is variable too, from 0-100% without color shift. 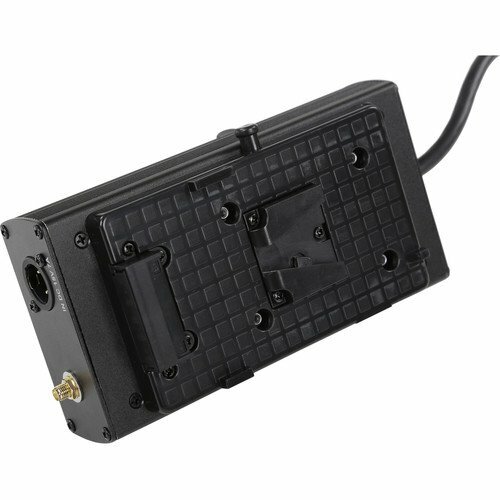 You can make these changes locally on the fixture, or remotely via DMX. Adjustments are simple to make on the fixture’s touch screen. 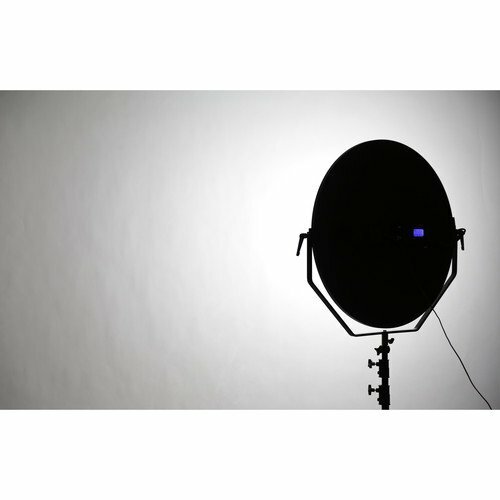 A special feature of the Luna-V is its 2.4 GHz Master/Slave control, whereby one light designated the master, can wirelessly adjust several other lights to its settings. 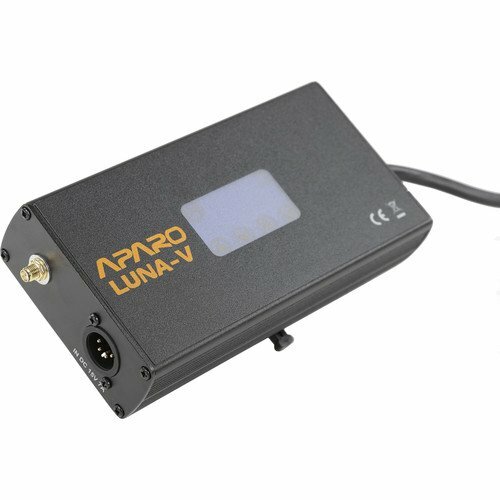 The Luna-V is ready for world-wide use thanks to its 110-240 VAC adapter but it can also run on V-mount batteries in situations where mains power is unavailable. Box Dimensions (L x W x H): 36.0 x 35.0 x 6.5"